My regular readers have been complaining about the dearth of recent posts. I can only plead pressure of work and some much needed decompression time away from the key board. But, I’m back! Sadly probably not bigger and better than before. I need to recap on the past couple of weeks: first up, La Kivilev. Once again, fortune smiled on us and despite torrential rains on the Friday afternoon, the Saturday of the event dawned warm, sunny and dry. A few early clouds were quickly banished and the smiles on the faces of the volunteers matched those of the participants. 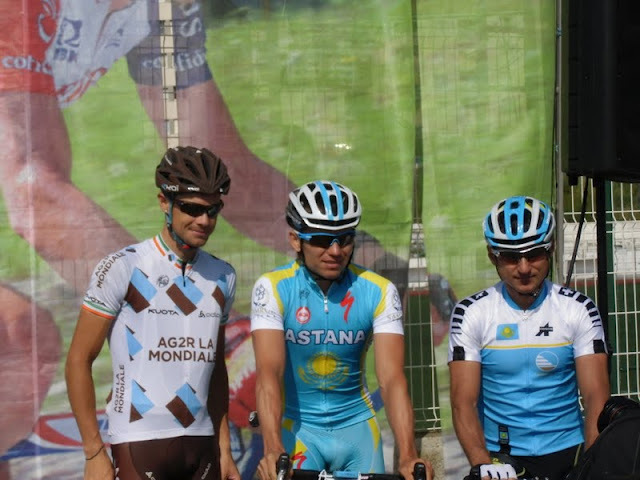 We attracted our usual stellar cast: the winner of this year’s Liege-Bastogne-Liege, Maxim Ingliskiy; the Kazakh national road race champion, Andrey Mizurov and, well-known local father and son pairing, Stephen and Nico Roche who were making their maiden appearance in the event. Stephen’s presence was particularly welcome as he celebrates the 25th anniversary of his holy trinity of Giro, Tour and World Championship. I like to think Nico was looking for that extra edge ahead of the Tour de Suisse or maybe just a welcome opportunity to stretch his legs with his Dad. Other local riders who would have been there were it not for other commitments included Geoffroy Lequatre, Amael Moinard and Tristan Valentin. Geoffroy was however with us in spirit, if not in the flesh, as his better half animated the event village with the G4 Dimension stand showcasing their cutting edge, top notch cycling and casual wear designed by Geoffroy. It’s stylish and made from the latest hi-tec materials. It won’t make you ride as fast as Geoffroy but at least you’ll look and feel as if you could! In terms of organisation, everyone agreed, this was our best yet but we can’t rest on our laurels and have already had our first post-mortem to look at where improvements can be made for next year’s event. It’s true that no sooner it’s over, we’re already planning for the following year. After the Kivilev, I generally feel in need of a vacation. This year was no exception. My beloved was also much in need of some down time in a WiFi free zone. Back in October I had booked a ridiculously inexpensive trip to Barcelona to go and watch my first MotoGP live. Now, I’ve written almost nothing about MotoGP this season but that doesn’t mean to say I haven’t been glued to the action on the wide screen so I was really looking forward to this trip. Rather than drive, we had decided to fly to Barcelona and hire a car. We arrived late on the Thursday evening and drove straight to our hotel, just down the coast from Lloret del Mar. This immediately brought back childhood memories of my first trip to Spain when I was five. We stayed in Lloret, then an unspoilt strictly Spanish holiday town with one hotel. There was a fiesta one evening while we were there and I so wanted one of those red and white spotted flamenco dresses particularly when I saw lots of cute, dark eyed moppets my age wearing them. I’m still waiting – one day! The resort was busier than anticipated particularly with bus loads of tourists from all over Europe including what seemed like thousands of kids taking part in a local football tournament. Indeed, we had a team from Nice staying in our hotel. The resort was also ridiculously cheap by comparison with here. For example, we never paid more than a euro for coffee while here the cheapest is Euro 1.40. Just don’t get me started on the price of alcohol. Needless to say, you could easily get blind drunk on ten euros and have change to spare. Friday morning, bright and early we braved the hotel breakfast buffet before climbing in the car and heading for Montmelo. I wasn’t going to miss a moment of the practice or qualifying sessions. Friday’s a quieter day at the circuit giving spectators the opportunity to wander at will and visit the pit lanes after the day’s practice sessions. It was noisy enough to warrant earplugs although most spectators didn’t bother. The circuit was well appointed and the eats and drinks on offer were reasonably priced which made a change from similar overpriced events in the UK. I don’t like heights and I particularly don’t like walking up stairs where you can see through the gaps to down below so I had a few nervous moments each day ascending to our tribune seats. Once there, I never budged. Instead it was my beloved who popped up and down to fetch the assorted refreshments. Unsurpringly, many of the specatators arrive on their bikes and then strip off their leathers to sit in their skimpies to enjoy the racing, proudly displaying their tattoos. My beloved and I were a tattoo free islet in a sea of painted bodies. A number of things struck me. 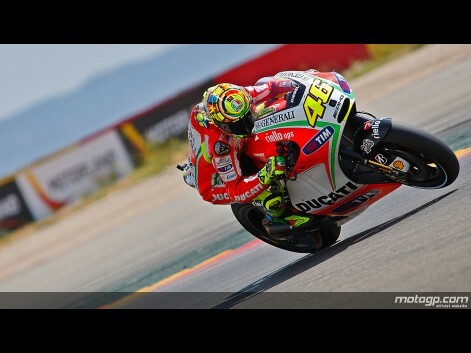 We were in Spain but the most popular guy on the circuit by a mile was Valentino Rossi. Indeed, stalls selling his branded products couldn’t take the money fast enough. Not all the riders are well known enough to sell their own brand of essentially t-shirts, caps etc. It’s basically just Rossi, Pedrosa, Lorenzo, new kid on the block Marquez and Spiess. I thought Spiess’s designs were superior but he doesn’t sell as much as the others. Rossi outsells everyone else 100 to 1, with Marquez, who’s likely to be the next Rossi, way down in second place. Stoner might be the reigning world champion but he doesn’t seem to engender much support apart from his home crowd. I’d chosen our tickets well. We had an excellent view of the straight, the leader board, a big screen, the first corner, the first hill and the descent giving us a grandstand seat where most of the action unfolded during practice, qualifying, warm-up and race-day. The weather was excellent throughout the three days albeit with some rain on the Saturday which quickly dried up. Everything worked as per the programme and there’s more than enough action and variety to retain one’s interest throughout the three days. The only thing missing was the excellent commentary from British Eurosport’s crack team of Toby Moody, Julien English and Neil Spalding which I adore as it greatly adds to my knowledge of the sport. It just wasn’t the same in Spanish. Would I go again? You bet. The Monday after the MotoGP was spent in Barcelona, a place my beloved has visited frequently for work but has never had an opportunity to look around. I was happy to be his guide as we wandered around enjoying Barcelona’s magnificent architecture. Arriving at the airport for our 20:00 flight we were told that the flight had been switched to 08:00 that morning. My beloved had been advised but hadn’t noted the change! Thank goodness he’s a “gold” card holder. We were booked onto the following morning’s flight and put up in the airport hotel where we were fed and watered. This last week end we went up to Isola 2000 with some friends. It was kinda nice having the entire resort to ourselves apart from the assorted wildlife. I drove up there on Friday afternoon while my beloved rode. However, he couldn’t face the ride from the village to the resort so I had to cram him and his bike on the car. After a delicious dinner, and a good night’s sleep, we were ready for anything. The descent from the Col de la Lombarde is technical, lots of hairpin bends. I overshot a couple but fortunately without serious consequence largely because the road’s wide and the surface excellent. 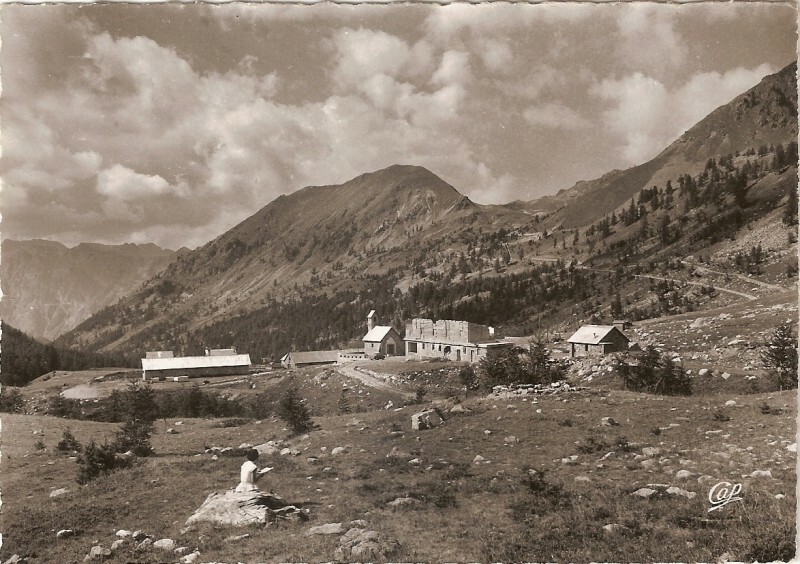 We rode as far as St Etienne sur Tinee which is where you start the climb for Col de la Bonette conquered by me and my beloved two years ago. We stopped for coffee and chocolate before turning around and heading back to Isola 200o and that Col. I let everyone else go at their own pace ie faster than mine. We’d half thought we’d conquer the 17km climb in around 2 hours but as I glanced down at my Garmin I realised I was certainly slo-mowing. The incline’s an average of 8% but for the first five kilometres my Garmin never dropped below 9%. In fact, 9% was starting to feel like a false flat. It’s only as you start to approach the village (3km from the summit), and a series of tunnels, that the road flattens for a bit. I’m unaccustomed to long, steep hills so this was good training. At least that was what I kept telling myself. Three days later, my legs still ache!